In this paper, we propose an innovative approach for registration based on the deterministic prediction of the parameters from both images instead of the optimization of a energy criteria. The method relies on a fully convolutional network whose architecture consists of contracting layers to detect relevant features and a symmetric expanding path that matches them together and outputs the transformation parametrization. 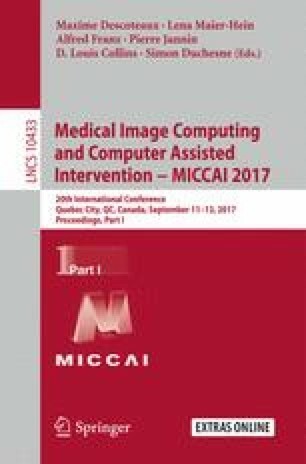 Whereas convolutional networks have seen a widespread expansion and have been already applied to many medical imaging problems such as segmentation and classification, its application to registration has so far faced the challenge of defining ground truth data on which to train the algorithm. Here, we present a novel training strategy to build reference deformations which relies on the registration of segmented regions of interest. We apply this methodology to the problem of inter-patient heart registration and show an important improvement over a state of the art optimization based algorithm. Not only our method is more accurate but it is also faster - registration of two 3D-images taking less than 30 ms second on a GPU - and more robust to outliers. The authors acknowledge the partial funding by the EU FP7-funded project MD-Paedigree (Grant Agreement 600932).